Inspired by the work of their foundress, Mother Emilie Gamelin, Sisters of Providence respond to the cry of women and children in need. Though their specific ministries have changed over the years, the sisters continue their work to address poverty and homelessness in the communities they serve. 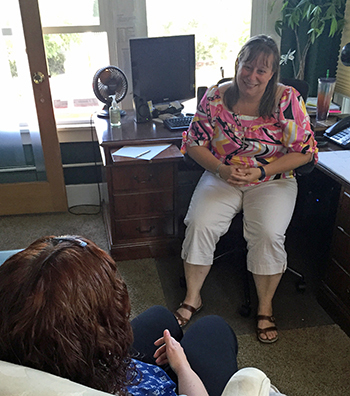 Sr. Jessica Taylor meets with a Sojourner Place client. Founded in 1983, Jubilee Women’s Center operates two residences in Seattle’s Capitol Hill neighborhood in addition to Sojourner Place in the University District of Seattle. In 2018 Jubilee housed and supported a total of 59 women, and served nearly 2,000 others with referral services, learning opportunities, a computer lab and a free clothing boutique. The story behind the collaboration between the Sisters of Providence and Jubilee Women’s Center began in 2013 when the sister and the former Providence Pariseau board of directors began their search for a partner who could continue the Sojourner Place ministry. They approached Jubilee Women’s Center and the parties spent several months considering the relationship. It was evident the organizations were well aligned in mission, values and programs, with a focus on providing caring, holistic support to help low-income women transition to independent living. Collaborating with Jubilee Women’s Center would enable the long-term sustainability of Sojourner Place, as well as deepen and expand services to the growing number of women experiencing poverty and homelessness in the Seattle area. They drafted an agreement that would preserve Sojourner’s housing and support services and allow the sisters to transition their ministry to an organization positioned for growth. Sisters of Providence is one of four congregations of women religious that sponsor the Transitions intercommunity ministry in Spokane. 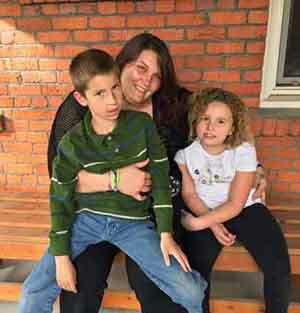 The mission of Transitions is to work to end poverty and homelessness for women and children in Spokane. Programs include EduCare, Miryam’s House, Transitional Living Center (TLC), Women’s Hearth, the New Leaf Bakery Café, and most recently, Home Yard Cottages. Transitions opened Home Yard Cottages in September of 2018. The development includes 24 residences for formerly homeless individuals and families living below the poverty line and coping with physical and mental challenges. Building Bridges, in Portland, Oregon, is a network of pediatric long-term care facilities providing care for children who are medically fragile and require 24-hour skilled nursing. Regular educational conferences offer a vehicle for sharing best practices as well as for developing support and advocacy for the children and their families. Watch: Respect for Human Dignity, a video about the work done and the clients served by Transitions.